This is one of my mom’s favorites, she made it to eat it with fish terrine for that crazy Jan 1st meal. Seems like she recently got into bread making and so excited to make it for me. I love breads in France, all of them, baguette à l’ancienne, baguette tradition, pain de campagne, etc…they’re all so good that I love to eat them just plain, like some people would eat cookies and bread is the first thing I request when I arrive. Not all bakeries make great bread but we all know where the best bread in town is, and get it fresh every morning and people have absolutely no problem driving a few miles to get the bread they want even though there is a boulangerie (bakery) at every corner here. Every one has its favorite boulangerie and we can have serious discussions about where the best bread is and why. Too bad I am no baker, otherwise I would open one in my San Francisco neighborhood since finding good bread there is like a mission impossible. Or eventually make it for my own consumption…I repaired my own shoes once, so why not make bread? I think making great bread is not an easy task though, you need the right ingredients, and a perfect humidity. I think the constant high humidity level in San Francisco makes it difficult to keep the bread crunchy for too long. She made this bread very quickly and I was impressed with easiness of the process, it’s fairly simple. So you don’t need to be a baker to make it. I always thought it’s impossible if you’re not a baker to make good bread, and I have to say that some home made breads can be delicious. In a container, place flour, add salt and mix. Dissolve yeast in water, and add gradutally to the flour. You need to have a little sticky consistency. Mix but to not over knead dough. Make a thick baguette shape bread. Let it rise for 2 hours. When dough has doubled its size, insert fig pieces and sprinkle with flour. Cook in a pre-heated oven for about 30 min. or until the bread is golden brown. This entry was posted by silvia on January 4, 2010 at 4:48 am, and is filed under Breads. Follow any responses to this post through RSS 2.0.You can leave a response or trackback from your own site. Bread is my complete weakness of any kind, This is quite interesting I must say. Doesnt sound sweet, what would you put on this jam or butter? Sounds wonderful and easy. I love figs…a nice change very nice. 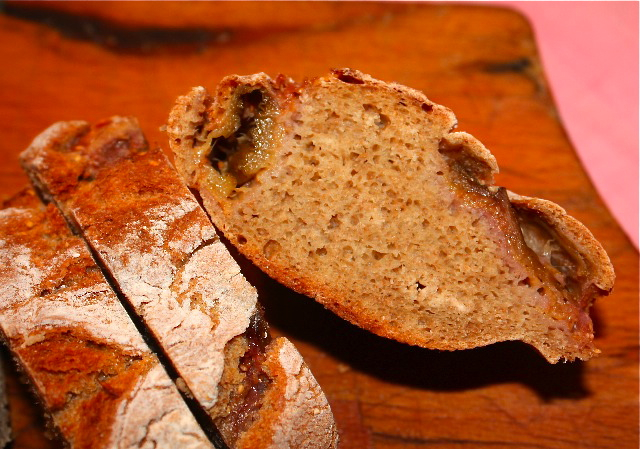 I love eating fig bread with goat cheese! Thanks for sharing your recipe. Happy 2010! Yum! I am on a bread kick and will have to try this!!!! I could almost smell the bread. 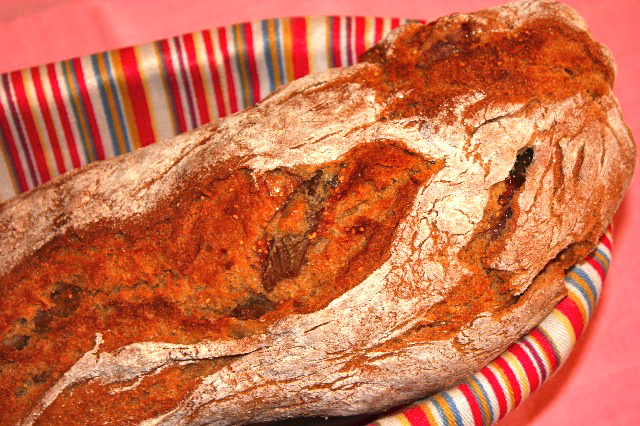 Loved freshly baked bread and of course figs. Thumbs up for any bread homemade!Looks gorgeous! So beautiful! Staring dreamily at fresh-baked bread — short of having a slice, is there anything better?? I love the smell of baked bread in the oven. Lovely idea with the figs. that bread looks so fresh and soft. I can almost smell it from here! I’ve been thinking about making bread for months now. I think this post may have just given me the final push I need to do it. Just a few ingredients, and a bit of sweetness too. I agree with French Cooking for Dummies…a little goat cheese would be really nice with this bread. The bread looks wonderful, do you know if its possible to bake it with sourdough starter instead of yeast? J’adore les figues et dans du bon pain–just perfect. It would be great with some salty cheese or hazelnut butter. I’m a bread lover as well! Saving this up for later use. You’ve fun, Silvia! Hi Dimitri, I have no idea about the sourdough starter, you could try and let us know. I guess it is possible! thanks!